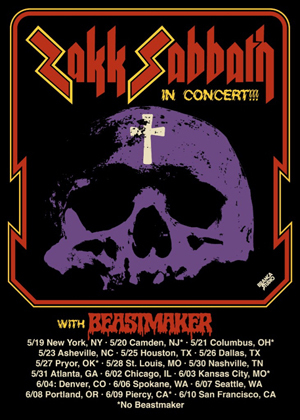 ZAKK SABBATH, featuring Zakk Wylde (BLACK LABEL SOCIETY, OZZY OSBOURNE), bassist Blasko (OZZY OSBOURNE, ROB ZOMBIE) and drummer Joey Castillo (DANZIG, QUEENS OF THE STONE AGE) will embark on their first ever US headline tour this May 19th - June 10th. A tour video is now streaming below. Tickets will go on sale Saturday, February 4th at ZakkSabbath.live, and VIP upgrade packages will be available on Monday February 6th at the same location. Support for the trek will be BEASTMAKER (Rise Above Records) whose new album, Inside The Skull, will be released on May 26th.